Pilipinas Taj Autogroup, Inc., the exclusive distributor of Tata Vehicles is continuing its market expansion with the groundbreaking of Tata Motors Isabela. Operated by Auto 10 Trade and Services, representatives from Pilipinas Taj together with the officers of Auto 10 Trade and Services broke ground last April. This formal marks Tata’s expansion in Isabela, the second largest province in the Philippines. 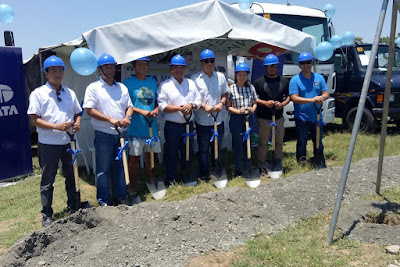 The groundbreaking ceremony was headed by Cordon, Isabela Mayor Lynn Zuniega, PTAJ President Mr. Cresencio “Jon” Fernandez, Jr., General Manager of Auto 10 Trade and Services Mr. Neil Carlo Uy Federizo, Vehicle Sales Manager Ms. Rochelle Raquepo, Technical and Engineering Division Head Engr. Ramil Mendoza, Sales and Marketing Division Head Mr. Rico Macalintal, and Vehicle Sales Consultants Mr. Jun Deri and Mr. Johny Asuncion. Set to open on the third quarter of this year, this new dealership, located at NCF Prime Compound, National Highway, Purok 2, Brgy. Taringsing, Cordon, Isabela shall offer vehicle sales, full service, and spare parts. PTAJ conducted a presentation to the local truckers and banks right after the ceremony tackling Tata’s background in automotive, all the vehicle models, the current network, and future plans.